First of all Denim Vistara family Congratulates all of the readers at our blog for the Celebrations season of 2018 started this Month (October) with the Devotional Start of 9 Days Navratri dedicated to the worship of Shakti, next to it Dussehra (Vijaya Dashami) celebrating the victory of good over evil and then the one of the festival of lights “Diwali” . 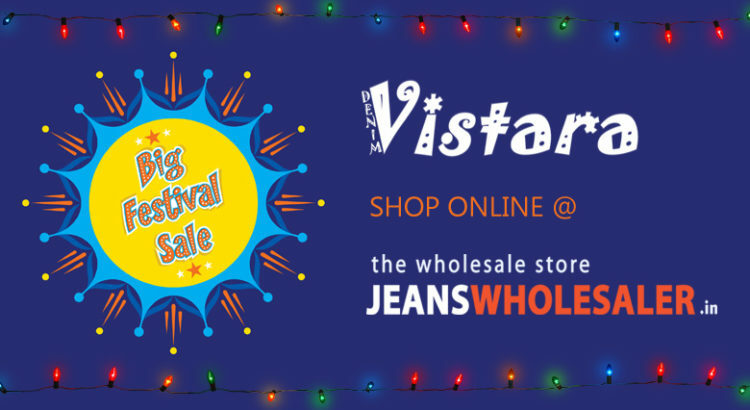 At this festive season of joyousness, Denim Vistara announces lots of amazing sale offers on its Jeans Wholesaler deals which would be applicable all over India. We also want to inform all of our loyal customers that now they would be able to shop jeans online at wholesale prices. If you are a retailer and wants to deliver something exclusive design of Jeans, Shirts, T-Shirs for Men’s and Women’s Wear then it is an opportunity to buy at bulk quantity with our 100% secured payment system and efficient delivery system. Retailers can have a good chunk of profits with each sale of the New Rise Brand of Denim Vistara .